Let’s face it: those Easter decorations transform into Christmas trees before you can say ‘I should start planning’. December is rushing this way, so beat the holiday rush and start that party-planning at Cowch! T’is the season to eat dessert, after all. The holiday rush can leave you feeling muddled – unwind with a team masterclass at Cowch! Plan a cocktail-style party with a twist as our leading bartenders run you through the creation of our signature cocktails. Let the team unwind with a night of fun, laughter, and taste-testing as you move into the Christmas period. After you’ve enjoyed your cocktails, the team can explore the full Cowch menu for nibbles and laid-back socialising. Treat the team to an end-of-year cheers at Cowch. From crazy work hours to that dreaded EOFY pressure, it’s great to cap things off with a few well-earned cocktails, beers and wines. With cocktails and desserts on the one menu, there’s a guilty pleasure for every team member. From salted caramel espresso martinis to Cowch lager on tap, you’ll find something for every palate at Brisbane’s sweetest office escape. Pull on your best red and green for a Christmas-themed dress up party! With exclusive venue hire, this is a festive affair the whole office will love. Whether you’re going as an elf, Frosty, or the big man himself, it’s finally time to ditch the corporate garb – Christmas is here. Gift the whole team with platters of Cowch desserts and a bar tab sure to earn a place on the ‘naughty’ list. There’s nothing sweeter than the phrase ‘annual leave’ – unless it’s followed by a visit to Cowch, of course. Christmas is a time to leave that paperwork behind for days with the family, and we’ve got a whole day choc full of plans at Cowch. Take the kids in for their very own Kids’ Experience, where they design their very own Naked Pop and smoothie! Meanwhile, the adults can lounge on our cosy couches for an afternoon of cocktails and dessert. Add this one to the Christmas wish list. Skip the ham and turkey and go straight to dessert this festive season. At Cowch, we’ll organise a Santa-sized assortment of dessert platters for the whole family! 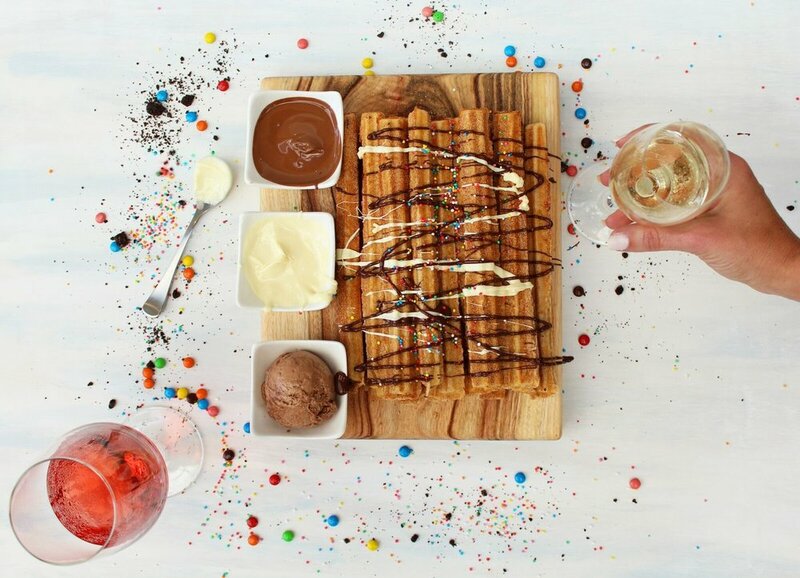 From chocolate-topped pizzas to churro platters and decadent Moo Burgers, this is the gift everyone’s been waiting for. Ready to start planning your 2018 Christmas party? Chat to the team at Cowch today!